Andrea Collins knows better than most the value of a Samford University education. "I joke that when Samford offered me admission in 1984 that they did not realize it was for life," she said. Collins has four nursing degrees from Samford. After earning her associate and bachelor's degree—she was pinned by Ida V. Moffett and has the pictures to prove it—Collins stepped away from the classroom for almost 20 years before a medical mission trip to Honduras opened up new doors of interest. "Working in this capacity gave me a desire to become a nurse practitioner so I could provide similar care to patients in the U.S. 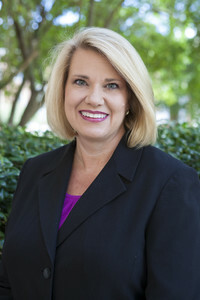 I looked at other options, but was drawn back to Samford because of the mission, reputation, pass rates and high academic standards in Ida V. Moffett School of Nursing." She eventually went on to earn her doctorate and uses her real-world experiences to help with the practical application of textbook information. "I can't imagine teaching anywhere else," she said. Collins, A. (2016). Statin Benefit Groups: Clinical application of the 2013 AHA/ACC Guideline on the Treatment of Blood Cholesterol to Reduce Atherosclerotic Cardiovascular Risk in Adults. Central Alabama Nurse Practitioner Association Continuing Education event. Collins, A. & Holston, J. (2015). Managing Pain in Primary Care: Appropriate Pharmacotherapeutic Strategies. Central Alabama Nurse Practitioner Association Continuing Education event. Collins, A. & Holston, J. (2015). Say Goodnight Safely: Evidence-based options for the treatment of insomnia. Central Alabama Nurse Practitioner Association Continuing Education event. Cortes, C., Collins, A., Cunningham, J., & Bigham, A. (2015). Pilot Study to Incorporate Interprofessional Education with FNP Students in an Online Program and Pharmacy Students in a Traditional Program Using a Blended Approach. Interprofessional Health Care Summit. Savannah, GA.
Collins, A. (2014, August 15). Physical and Medical Issues of the Aging Population. Invited Speaker- AlaCare Care at the End of Life Conference. Birmingham, AL. Bigham, A., & Collins, A. (2014). Strategies for Designing Interprofessional Education Projects for Undergraduate and Graduate Nursing Students. Invited Presenters for NurseTim webinar. Bigham, A., Collins, A. (2013). Internal Samford University Technology Grant. Improving Nurse Practitioner Student Recognition and Management of Abnormal Physical Findings Through the Use of Standardized Patients and Technology. Collins, A., Whisenant, D. Holston, J. (2013). Internal Samford University Faculty Development Grant. A Comparison of Magnesium vs. Melatonin for Improved Sleep Quality and Quantity.